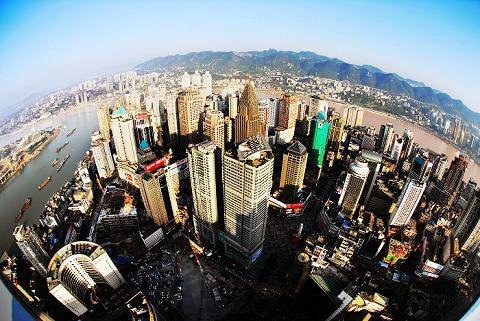 Over 3000 years in history and local culture, the youngest municipality of China, the largest inland city of rivers and mountains on the planet, the city of sheer exuberant friendliness, the city of miracles, this is new Chongqing (chóng qìng 重庆), the economic center of the upper Yangtze (cháng jiāng 长江), prepared to embrace the rest of the world. 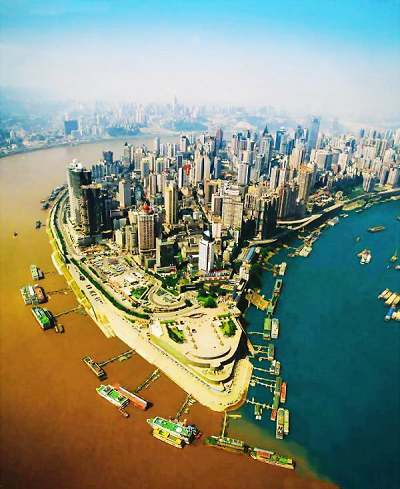 The center of the old city of Chongqing (chóng qìng 重庆) is almost completely encircled by the two arms of the Yangtze River (yáng zǐ jiāng 扬子江) and Jialing River (jiā líng jiāng 嘉陵江). Row upon row of buildings climb the hills beside the rivers, giving rise to its nickname the "city of hills (shān chéng 山城)" and the phrase "night views of the hilly city (shān chéng yè jǐng 山城夜景)" known well both in domestic and in overseas. observing the nocturnal scenes which form a colorful three-dimensional painting, with waves of the Yangtze and Jialing river glistering against moonlit, star spangled sky,is an amazing experience that you shall never miss. 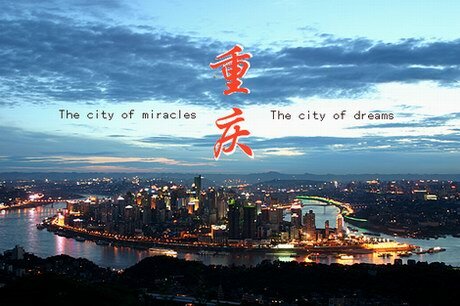 Jiefangbei (jiě fàng bēi 解放碑), which stands in the most prosperous downtown of Chongqing (chóng qìng 重庆) is not only the symbol of civilization but also the evidence for history of half a century. 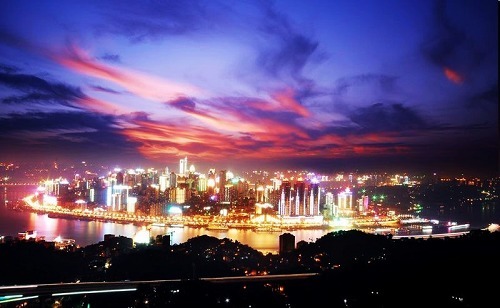 It is referred to as Chongqing’s mother town, which is backed up by plentiful cultural gatherings, vibrant streets and enthusiastic people, representing a city in the eyes of the local people and serving as a pronoun for Chongqing in the eyes of peoples outside of Chongqing. Located at the very tip of Yuzhong Peninsular (yú zhōng bàn dǎo 渝中半岛), situated at the junction of the Yangtze (yáng zǐ jiāng 扬子江) and Jialing River (jiā líng jiāng 嘉陵江) in the northeast of Chongqing (chóng qìng 重庆), Chaotian Gate (cháo tiān mén 朝天门) overlooks the two rivers and is surrounded by crags on three sides. It is said to be the best place to start sightseeing, where the muddy, churning waters of the Yangtze meets the transparent water of Jialing River. 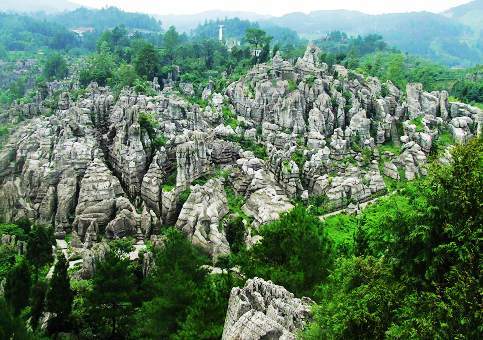 Located 165km from downtown Chongqing (chóng qìng 重庆), Wansheng Stone Forest (wàn shèng shí lín 万盛石林), which was formed about four hundred and sixty-five million years to six hundred million years ago and it was formed two hundred million years earlier than Lunan Stone Forest (lù nán shí lín 路南石林) in Yunnan province (yún nán shěng 云南省), is called "the Ancestor of Stone Forest". The scenic area covers more than 10 square kilometers. Touted as a "geological museum", this maze of towering karst structures is fascinating.